By the early 1850s, when Richard Beard's patent to the Daguerreotype process of photography had expired and Scott Archer had introduced a more sensitive wet collodion process, photographers were free to set up commercial studios employing either method. Success in this venture largely depended on the photographer's ability to attract sufficient demand as well as his skill in operating the photographic equipment. The subsequent growth in the number of studios in London greatly reduced the cost of portraiture. 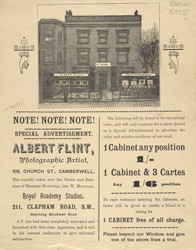 In this advertisement from the late 1880s, the photographic artist, Albert Flint announces his special prices for the Cabinet portrait, a large photograph of one sitter or a small group, which was intended for display. Examples of such work are shown here in Albert Flint's studio window. Also advertised are cartes de visite, small visiting cards featuring the a photograph on one side and the name and address of the sitter on the other. Albums containing these cards became popular collectors' items.